Philadelphia is halfway between Washington DC and New York City. Philadelphia is, if you want, the city in which the United States of America were founded. You can see Philadelphia in two hours. In theory. Hands-on, you should definitely take a little more time than the two hours which the Big Bus sightseeing company promotes. You got me, I took part in one of their tours. Yes, that was a mistake (but we’ll get to that later). Fortunately though, I did not make the mistake to believe that you can actually see the city in two hours. The boyfriend and I spent 33 hours in Philadelphia. And today, I’ll show you the best things to do on a short break like that. We catch our Amtrak train to Philadelphia at the monumental Union Station. The fare is 40 dollars, a bit more than Megabus but I really wanted to ride on an American train to see the States from a different perspective at least once. Boarding takes some getting used to. We aren’t allowed to wait on the platform. Instead, we have to stand in line in the concourse until we are hurried down to the platform where the train is ready to go. I’m surprised by the super wide, super comfy seats. There’s wifi and sockets at every seat. Sweet. The first glimpse we get of Philadelphia is a super dark platform. I’m not really surprised that people aren’t allowed to wait down here. The concourse is as impressive as in Washington. 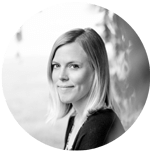 We start walking in the direction of our hotel which is located at the opposite site of the city center in the Historic District, about 30 minutes walking distance. Downtown Philadelphia roughly stretches from the Delaware River in the East to the Schuykill River in the West. 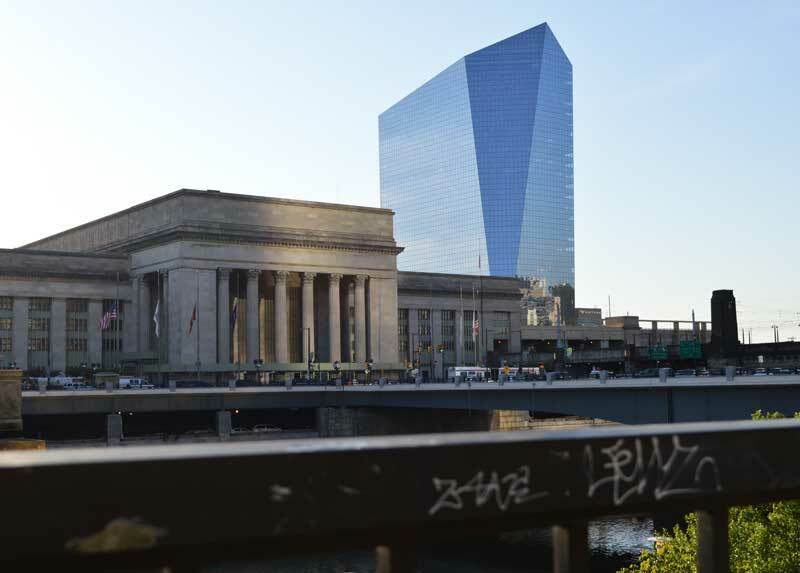 30th Street Station is located at the Schuykill, the Historic District adjoins the Delaware River. Halfway on Market Street, we catch sight of the City Hall – one of Philadelphia’s iconic buildings. 30th Street Station almost looks like a palace. We meet up with Phyl Francis. 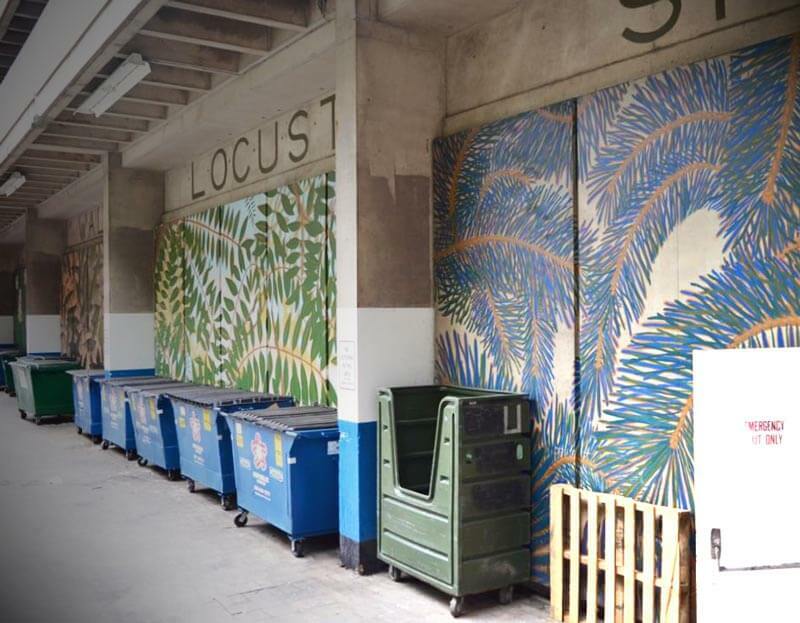 Phyl works for the Mural Arts Program, an initiative that transforms unsightly naked walls into pieces of street art to transform places and communities and fight against illegal graffiti and decay. Phyl will take us to some of the most beautiful and impressive murals in downtown Philadelphia on a walking tour. Did you know that there 3700 murals in Philly? That’s more than in any other city in the world. There’s art in ever corner of Philadelphia. We stay in the Historic District and amble up and down the streets. The Historic District lives up to its name. We come across small, wood paved alleyways and pass ancient houses and places (old by American standard) that all tell a story of the American history. A man tells me that the street I am standing in is more than 100 years old. I am impressed. Not. But there are some places that are fairly old – even by European standard. Among these is the house in which Thomas Jefferson composed the Declaration of Independence. And Independence Hall in which the Constitution was discussed and signed. Next to that hall, a limited number of visitors per day can catch a glimpse of Liberty Bell that remains a symbol of liberty and against discrimination until today. We also pass the house in which Betsy Ross is said to have sewn the first American flag. On a spontaneous whim, because we want to get a good overview over the city, because our Philadelphia Passes include a free ride and because we want to rest our feet after nearly a whole day of walking, we decide to hop on a Big Bus Tour – the kind of double-decker tourist bus with an open deck that I would – in my right mind – never ride. The guide promises that Philly can totally be done in two hours – the length of the bus ride. From that moment on she doesn’t stop talking and gesturing wildly (and spitting, ugh). Unfortunately, we cannot avoid her since we’re seated in one of the front rows. We leave the bus after an hour because we cannot bear the tourist chamber of horrors anymore. Do these steps look familiar to you? Yes, we’re still in Philly. Yes, the Champs Elysées are in Paris, but they have also found their way to the USA. Well, actually, the street leading from the Philadelphia Museum of Art to the City Hall is called Benjamin Franklin Parkway. But architect Jacques Gréber (a Frenchman, by the way) did have the Champs Elysées in mind when he sketched the area. 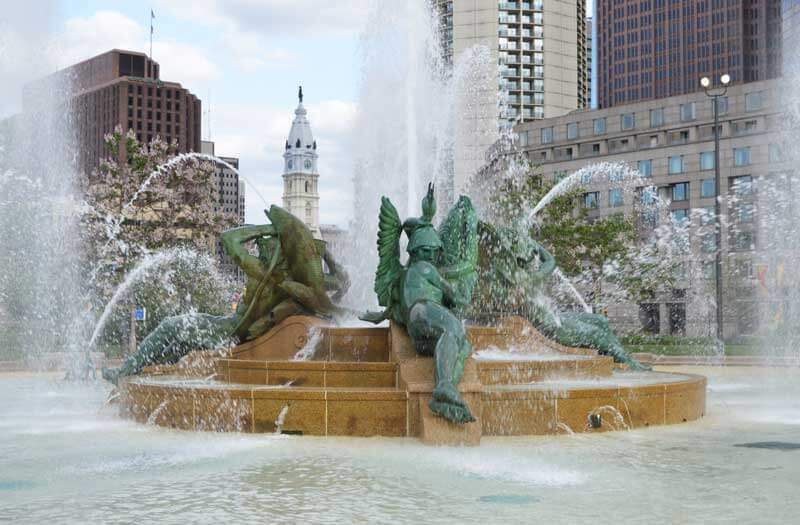 Today, the Benjamin Franklin Parkway is used for countless parades and festivities. It also is an outdoor art gallery, showcasing for example Auguste Rodin’s “The Thinker” or the LOVE sculpture by Robert Indiana. 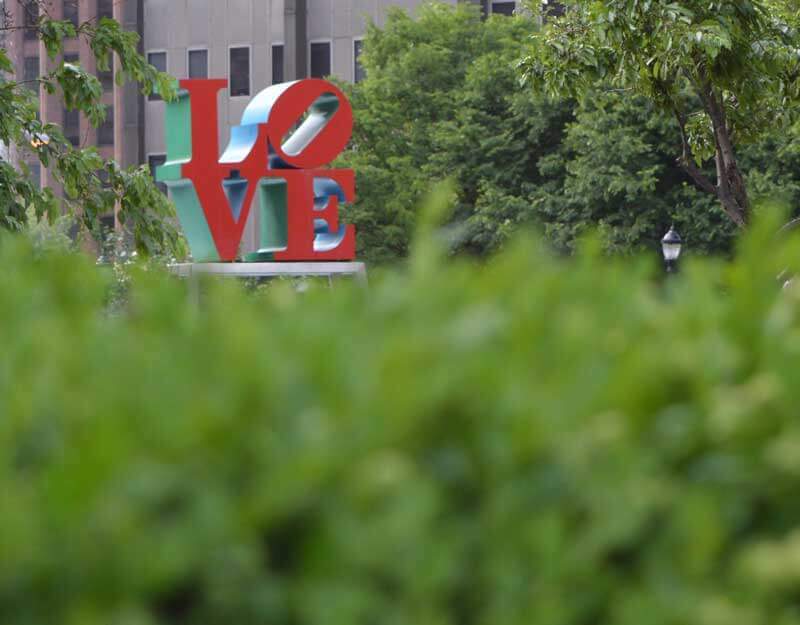 The LOVE sculpture by Robert Indiana. I am hungry (and I wouldn’t say no to an after-sightseeing beer or two). We stop by at Independence Beer Garden that is one of quite a few beer gardens that have opened in Philadelphia in the past years. It winds around a hideous office building and is furnished with so much love and so many flowers that the urban surrounding doesn’t disturb at all. Rather, it adds to the cool, relaxing atmosphere. We try German Style Beer (brewed in Philadelphia) and half of the menu. Beer and food are excellent – and affordable. 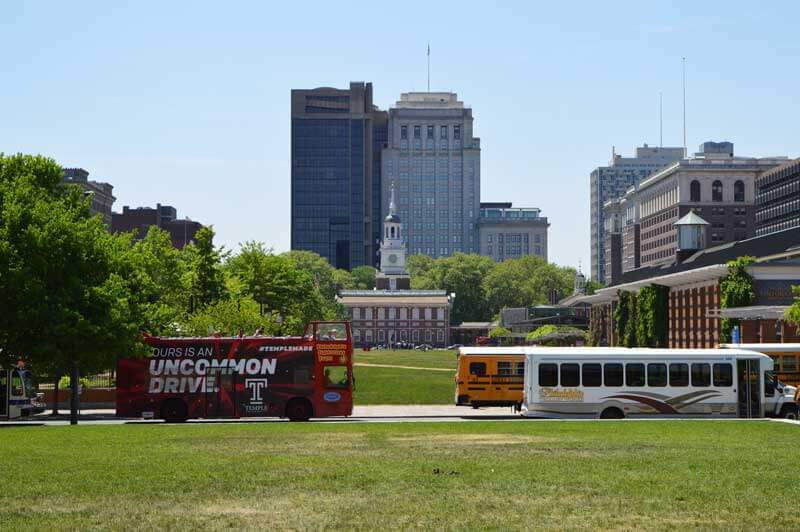 We try to soak in all the information we can get about Philadelphia at the Independence Visitor Center opposite of Independence Hall before we walk over to the Constitution Museum that is just steps away from Independence Park. There is a theater performance explaining American history every 45 minutes or so – it is patriotic and sugarcoated but it’s nevertheless informative and nicely presented. And it’s well worth the visit! If you are looking for lunch in Philadelphia, Reading Terminal Market is your place to be. You’ll get everything that your soul desires – from Philly Cheese Steaks to real German Bratwurst, from organs made of chocolate to raw salads and from Dr. Oetker vanilla pudding to Quesadilla. Since none of us ever tried Philadelphia Cheese Steaks before that’s the first thing we’re after. It’s a specialty made from minced steak, with loads of cheese and grease and served in a baguette style bread. Costs: $10. I am thrilled and decide never to eat anything else ever again (except maybe the fried pickles we had in the beer garden…). Even president Obama had a cheese steak at Reading Terminal Market during one of his visits to Philadelphia. Fortunately, it’s only a short walk to Dilworth Park. I am close to another food coma. 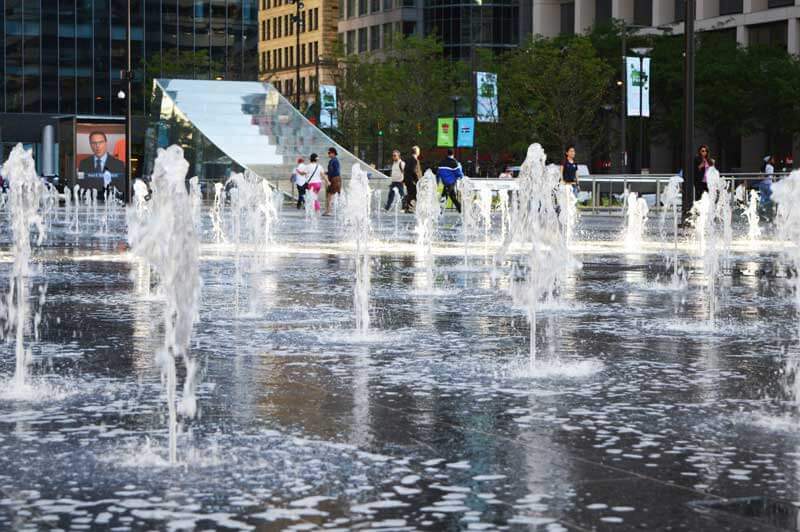 Dilworth Park isn’t actually a park as you’d expect it. It is northwest of the City Hall and it has quite a couple of fountains and some benches but only very little green space. We sit down on a small lawn and watch the people hurrying past. We are too late to get tickets for the City Hall Tower platform from which you get the best overview over Philadelphia. Like at Independence Hall, the allowed daily number of visitors is limited. More time for us to relax. We continue to amble through the streets – and before we know it we are back at Reading Terminal Market where we spot doughnut heaven on earth. It’s called Beiler’s Hand Rolled Doughnuts and they have 47 different kind of doughnuts – all made fresh before your eyes. I have a hard time to decide which ones I am going to try. I am tempted to buy half a dozen at $5 but I decide for two at 95 Cents each. Some insider’s knowledge: The filled doughnuts are the best! We still have some time until our return train to Washington departs and use it to hang around at Dilworth Park and let the sun shine into our faces. There is live DJ music and an elderly gentleman in a baseball jersey dances with an old woman to dancehall beats. Philadelphia is always good for a surprise, I guess. 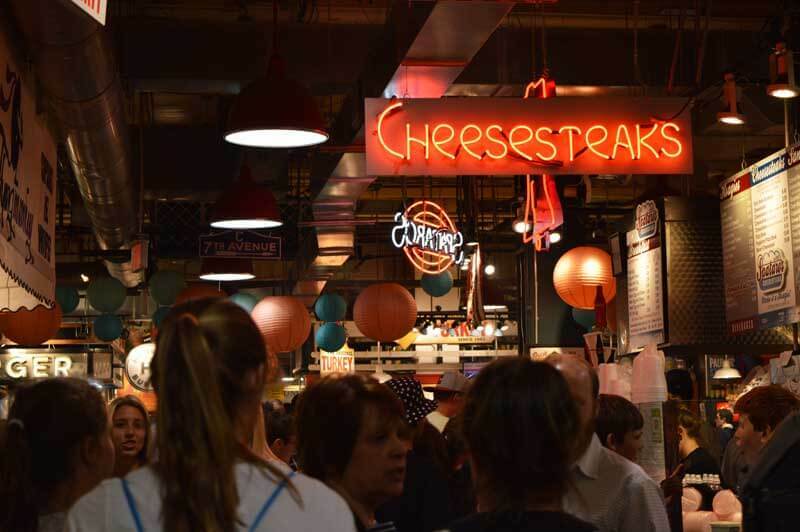 You’ll find everything that your culinary heart desires at Reading Terminal Market – from raw fruit and vegetables to delicious cheese steaks dripping with grease – freshly made from local products. The market is situated in a hall between North 11 and 12 Street on the corners of Filbert Street and opens Monday to Saturday from 8 AM to 6 PM and from 9 AM to 5 PM on Sundays. You’ll get a decent meal from $8. There’s a huge selection of beer at the Independence Beer Garden – bottled, canned or draft beer. Some of them may sound German, but you’ll never get a Troegs Sunshine German Pilsner or a Stoudts Gold Lager Munich Helles in Germany – since they are brewed in the USA. A beer costs between $6 and $8 and there are some interesting mixes. Peach Shandy, for example, or Rhubarb Palmer (Vodka, rhubarb, lemon ice tea). Food starts at $3 (fries or popcorn for example). 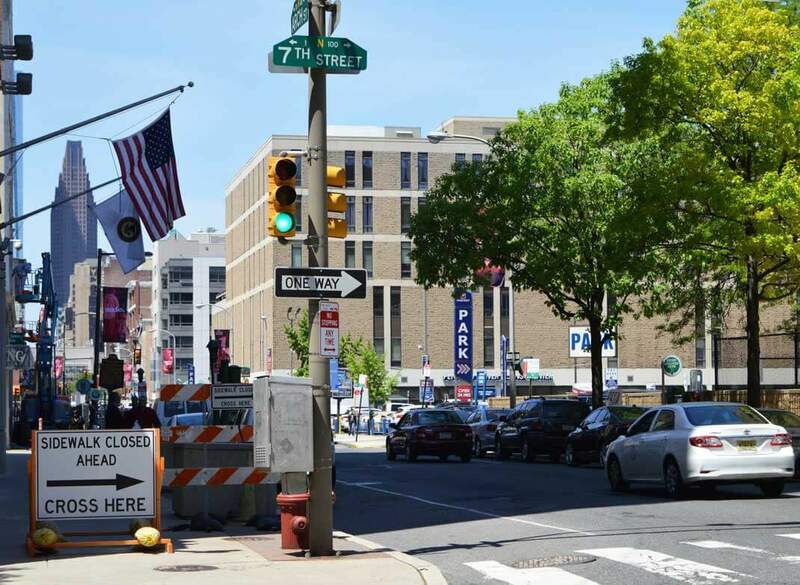 The Wyndham Historic District is a relatively newly renovated, big conference hotel with large rooms, a gym and a rooftop pool that opens from Memorial Day to Labor Day. Rooms start at $150. The hotel scores with a perfect location just off Market Street in the Historic District and very close to Liberty Hall. Book it here. 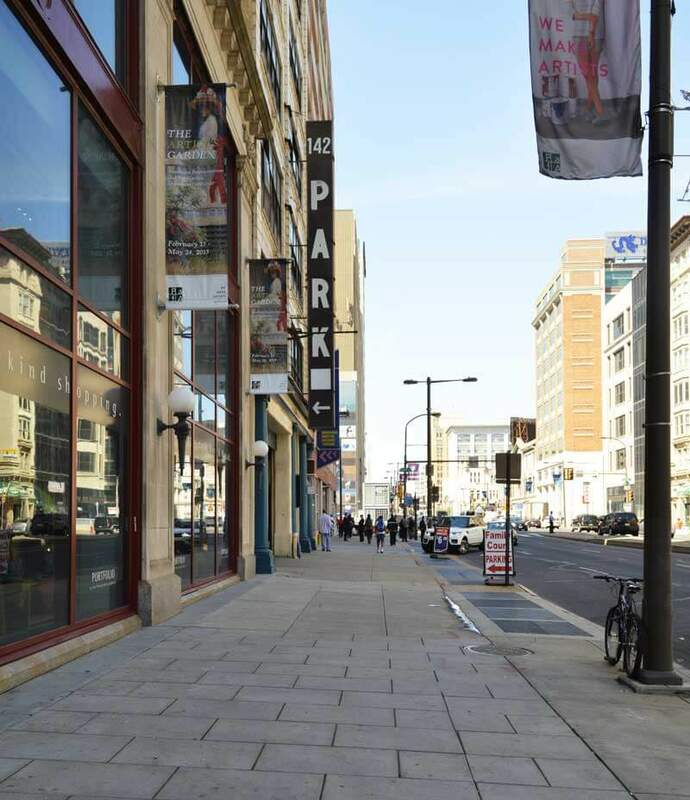 The Philadelphia Pass (from $55) allows you to enter a lot of Philadelphia’s top tourist attractions without paying any extra fees. It includes the Big Bus Tour (which I wouldn’t recommend) and a lot of places I do recommend (like the Constitution Museum). Some of the attractions (Liberty Hall and City Hall) only allow a limited number of visitors per day so it’s good to get timed tickets in advance. My trip to Philadelphia was supported by the Philadelphia Convention and Visitors Bureau. Thanks for the invitation! My opinion is in no way affected by this cooperation. I love articles like this because it gives the potential tourist a better idea of what to do so they can get the real feel of the town! Thanks for sharing, I enjoyed reading it! This has made me want to do a USA road trip even more!